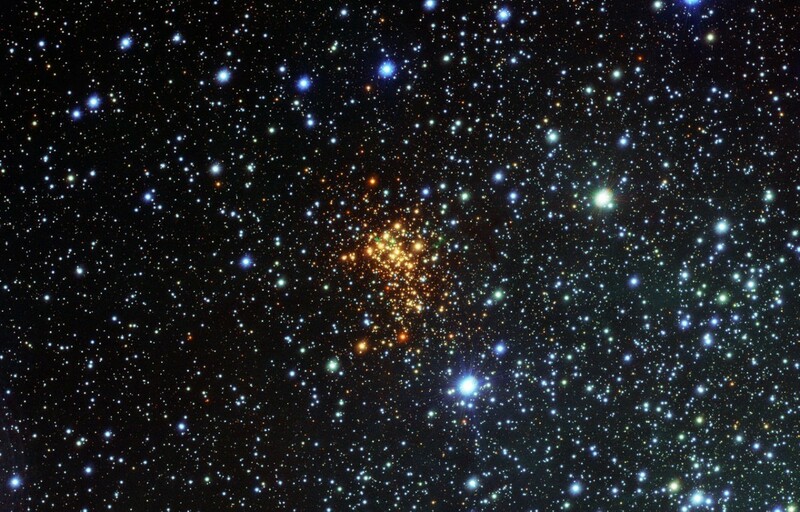 Giants lurk the heart of the Westerlund 1 cluster. It’s an open cluster that contains some of the most massive stars in our galaxy. It contains yellow hypergiants, red supergiants, Wolf Rayet stars and supergiant stars. Given its size and density, Westerlund 1 will likely evolve into a globular cluster. Because these different types of massive stars have particular lifetimes, we can actually get a pretty good handle on the age of the Westerlund 1 cluster. Red supergiants, for example, generally don’t form until the star is about 4 million years old. On the other hand, Wolf Rayet stars tend to die off after about 5 million years. So the cluster should be around 4 – 5 million years old. Since Westerlund 1 is only about 12,000 light years away, the cluster provides an excellent opportunity to study the dynamics of large stars. Since large stars create strong radiation fields, and eventually explode to release the gas and dust of heavier elements, they play a central role in the evolution of galaxies. If it will evolve into a globular cluster, will it’s lifetime be constrained by the fact it moves in the galactic disk instead of in the halo? Pity we can’t get a 3D GPU rendered view of this cluster / our galaxy in general to represent the sheer size and magnitude of the milky way.